iOS 5 (s aapl) is the biggest update yet to Apple’s mobile operating system. Along with over 100 other features, it brings Notification Center, an improved way to manage push notifications on your iPhone or iPad. Read on to learn how to get started using Notification Center. 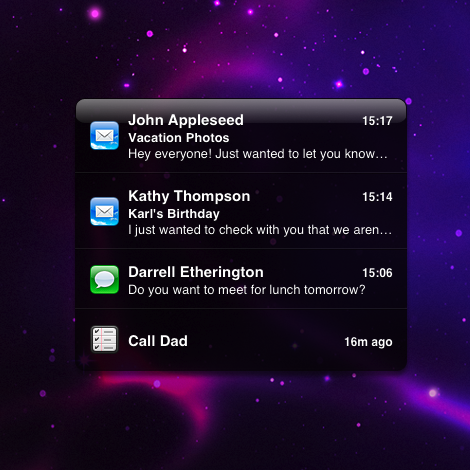 Introduced in iOS 3, a push notification is a message sent to your device by an app you have installed. For example, a turn-based multiplayer game may send you a notification to tell you it’s your turn. A lot of apps use push notifications, and a list of the ones on your device that do can be found in Settings > Notifications. What happens when I receive a notification in iOS 5? If your device is running iOS 5, then one of two things will happen. If your device is locked (the screen is off), then the screen will turn on temporarily, and the notification will be shown. If you do nothing or are away from your device, notifications will form a list so you can see them all at once. You can swipe across any of the notifications in this list to open the app they belong to. For example, if you get an SMS, you can swipe across its entry in the list to open the Messages app to reply. If you are using your iPhone or iPad at the time the notification comes in, it will appear in a banner at the top of the screen, then disappear after a few seconds. This won’t interrupt what you’re currently doing, unlike notifications in iOS 3 and 4, which required you to tap ‘Close’ to dismiss the notification. While these banners are visible, you can tap them to open the corresponding app. What happens to notifications I don’t respond to straight away? It might seem like unanswered notifications get sent away, never to be seen again, but don’t worry; iOS 5 is keeping track of them for you. If you’d like to see a list of received notifications, simply swipe downward from the time at the top of your device’s screen. A tray filled with recent notifications, called Notification Center, will slide down. You can then tap a notification in the list to view it in the correct app. If you’re using an iPhone, this tray will also show a Weather widget and a Stocks widget. These can both be turned off by going to Settings > Notifications, then selecting Weather widget or Stocks widget and sliding the switch to Off. Can I change which apps show up in Notification Center? You can indeed, by going to Settings > Notifications, choosing the app you’d like to turn on or off, and changing the Notification Center setting. You can also decide whether apps’ notifications appear in the Lock Screen by changing the setting at the bottom of the screen. When you’re looking at an app’s notification settings, you can decide whether notifications should show up as a banner, an alert, or not at all. An alert is the same as what push notifications were like before iOS 5: when a notification arrives, a box will appear in the middle of the screen, and requires an action to dismiss. You can also change the order in which notifications show up in the notifications tray: either by time or manually. If you select by time, the most recent notifications will appear at the top of the list. If you select manually, then they will show up grouped by application in the same order you set up in Settings. Once you select to sort them manually, you’ll be able to drag apps around in the list to reorder them. That’s pretty much all you need to know to get started with Notifications in iOS 5. Any other questions? Feel free to ask in the comments. I can’t get the Facebook notifications to STOP! I have them turned off and they don’t stop. When I go to settings/ notifications and select an app’s notification and select on in the “view in lock screen* the msg tone rings more than once but when I turn it off it ring once. I’m not receiving any push updates from any outside apps. I have updated everything that could be updated to iOS 5, and it’s really bothering me. I don’t regularly watch the news or read it online, so I rely quite heavily on my CNN and CDC updates. Facebook is also turned on, though I don’t use it often. I’ve checked to make sure they are turned on, which they are, and have been. I’m still not receiving updates like I should. The things that do show up on the notification center, are things I really don’t care that much for. Stock and such. In Notification Central I have Mail set to off, but I still receive Mail notifications. Is there a way to change the push notification sound? I like all the new text tones that are available, but Words with Friends and other apps that send me push notifications still use the same old tri-tone sound for push notifications. Can I change this at all? It would be great if the notifications could repeat. If for example, the phone mail notification would beep every 15 seconds until I get back to my desk, I would know there was a voice mail message on my phone without having to go check. The problem may be that push notifications for certain apps were previously turned off, but where is the option to turn these back on so that they can show up in notification center?? Has anyone found this option? i have twitter activated through ios5 but no tweets appear in notification centre why? Will there be more widgets other than stocks and weather? I would love to have the capability of having sb settings with out jail breaking. Brightness control with a flick of the finger would be awesome. How can you change which calendars show up? Before you were able to turn of push notification so they wouldn’t use up your data plan unless you check them yourself. Now with ios 5 that option is gone. So my question is, is my phone always using my data plan to check my apps? I cant get my calender in it, and is there still no way to turn 3g on and off some other way, then going to settings bla bla.. Horrible i should have kept my 4.3.3 jb..
Hey guys the only thing that works in my notification banner is my calendar. Nothing else shows up even if I go in and adjust it in settings. I updated but my iPhone3G didn’t show weather widget and stock on the lock screen. does it work on yours? The article is a bit off. Apple takes the liberty of already configuring some notifications for you – such as Mail. 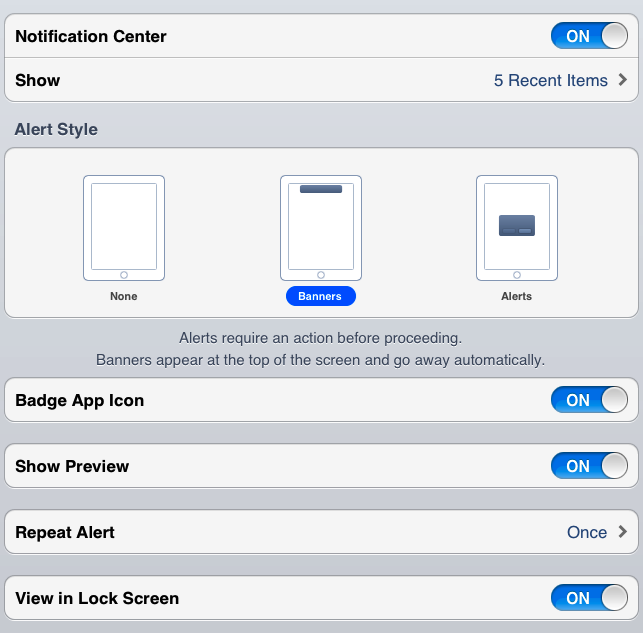 And they even go as far as configuring Messages to go to the Alerts (rather then banners). Might want to include the fact that the user should definitely jump into Notifications to very for themselves what is configured and setup in there. I had to reboot my iPhone a couple of times to get this to work. Hey all, I have the same problem as Allen. By default, the weather and stock widgets are shown in the notification centre but other apps cannot be seen even when they’re enabled. Any help? I just have one minor gripe…the events in all the calendars on my phone are shown in the Notifications Center, even if I have those calendars unselected (so I can’t see them in the Calendar app). Does anyone know a workaround? Yeah, this has to change. I need my Boss’s calendar on my calendar, but don’t need to know when his meetings are coming up. Can I use a different weather app to show up in the slide down notifications? Hi, I read that you can simply access your notification center from the lock screen as well. But for some reason, when I try to, nothing happens. Am I just suppose to swipe down (through the lock screen FYI)? If so, nothing happens when I do just that. Thanks for the help. Do I have to have the apps running to get notifications for them? I had them running and I haven’t gotten notifications, so I quit them and still nothing has happened, even though I’ve gotten mentions on Twitter, etc. For some reason Facebook and other apps I have turned on for notification center still don’t show up. Ideas? Same here, no ideas though. I’m having the same problem. 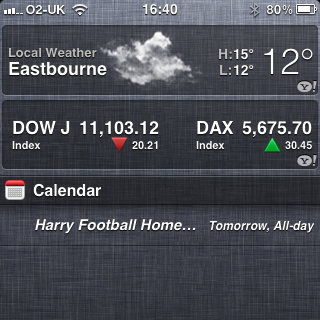 Only Cal and Reminders show up in Notification Center. Many other apps, including Mail, are enabled, but only those show. Have you tried to go into Notifications in Settings and verify that they are turned on? Also, make sure those apps are updated properly to iOS 5. Not sure if the migration of the notifications is seamless (I would assume yes – although the “alert” style of notification is still around).